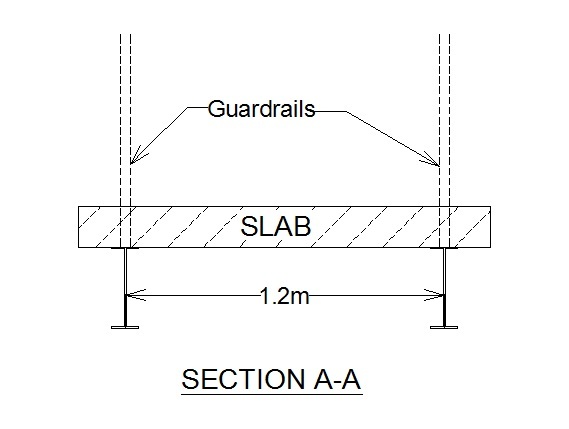 On a pedestrain footbridge, what would the expected LIVE and DEAD loads on a series of concrete slab (1.550m x 1.550m) support on two RSJ's with a clear span between RSJ's of 1.2m. There will be a floor screed of 65mm applied on top of the slab, followed by pesestrain movement. Dead loads for slab design are the weight of the slab itself plus the weight of the 65mm floor screed. Also should be added are weight of ceilings, sprinklers, duct work, etc that are directly hang from the concrete slab. The plan view above is an interpretation of the information provided. Also, the cross section below shows how the RSJs in relation to the slabs. In the US the normal weight concrete is normally estimated to weigh 150 pcf (pounds per cubic foot) or 2403 kg per cubic meter. With a thickness of 153mm, we have .153x2403 = 368 kg/sq. meter dead load. Assuming the floor screed weighs 100 pcf or 1602 kg/cubic meter, we have .065x1602 =104 kg/sq.m for a total dead load 472 kg/sq. meter. A pedestrian bridge such as this will work best if you use metal deck between the RSJs and then pour the concrete over. This will greatly minimize concrete forming especially if the concrete is to be poured after bridge is erected. To calculate the dead loads for the RSJs it will include the following: slab and floor screed mentioned above plus the weight of the RJs themselves. Also should be included are walls, posts, guardrails, and any framing for a roof structure above the pedestrian slab. 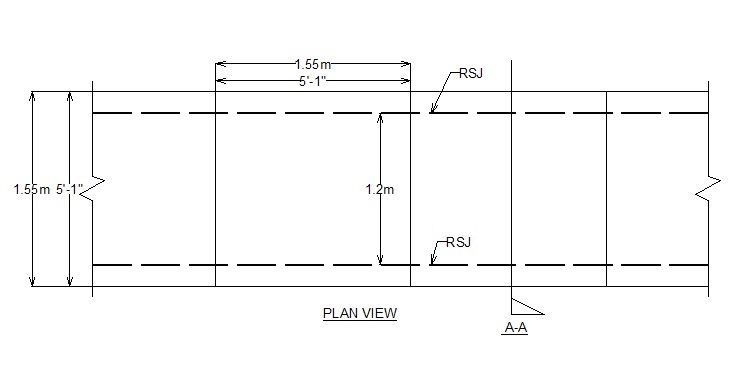 If there are any objects such as lights or ducts directly hang from the rsjs, their weight should be used in the calculations for selecting the appropriate rsj size. In the US the live loads for pedestrian bridges are typically 85 psf or 431 kilograms per square meter. This live load should be used to calculate the concrete slab thickness as well as the correct size of rsjs.